My first concept was to build a device to wear on my body and in which i wanted to cultivate plants out of body fluids. 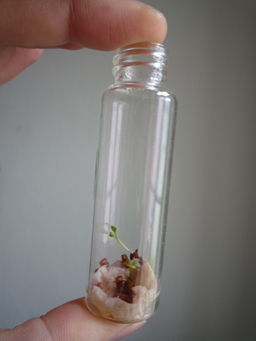 First experiments to feed the plant with my saliva failed, because the plant didn´t like the taste of my mouth so much. My new concept is to build a device which simulates withdrawal symptoms on my body if i´m not working with my computer for a longer period. Also it could activate if i´m working too long in front of the computer. The device itself consists of a bluetooth Arduino and an EMS-device (electronic muscle stimulation) which could be worn on the lower arm and simulates spasm states when it is active. 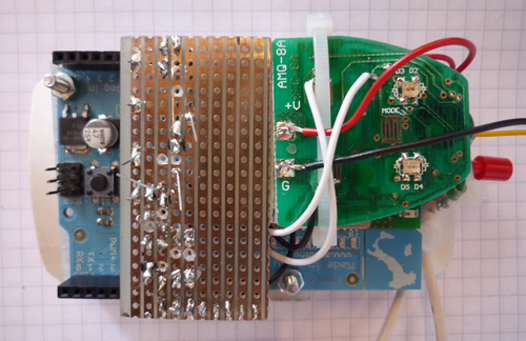 At the three days workshop at the TimesUP resort in Linz i have already implemented the connection and the control of the Arduino and the EMS-device on a compact board. 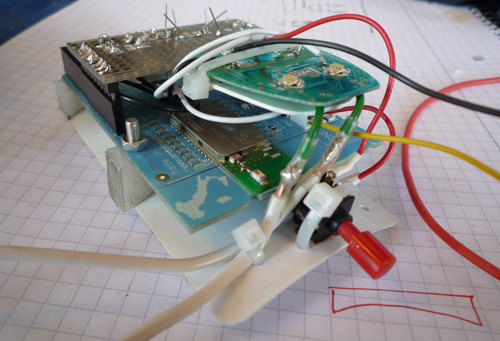 programming the Arduino and a Processing to control the device. Building of a compact wristband-like thing, to but everything on its place on my body. This entry was posted in Angewandte2010. Bookmark the permalink.